The story behind the name: The constellation name, Ursa Major, means Big Bear. The "bear" association has its origins in two major civilizations which saw two very different bears in the sky. The Greeks who named this constellation (later translated into the Latin name we use today) thought that the stars outlined the shape of a bear walking about on its clawed feet. It and its smaller companion, Ursa Minor were said to be the prey of Boötes and his hunting dogs. The long cat-like tail on the bears was part of the ancient pattern and is somewhat of a mystery. A story in Ovid tried to offer an explanation. In that myth, Zeus fell in love with Callisto. Hera changed her into a bear out of jealousy. Her son Arcus (the namesake of Arcturus, the alternate name for the constellation Boötes) came upon her in the forest and she ran to greet him. Not knowing the bear was his mother, he was about to kill her. To save her, Zeus turned Arcus into a smaller bear, grabbed them both by their tails and flung them into the sky, causing their tails to be stretched. A number of Native American tribes also referred to this constellation as a bear, but with a clever addition. In their description of these stars, the bear is the same, but without the "tail". Instead, those three stars are three hopeful hunters, and the middle one is carrying a cooking pot for cooking up the bear. 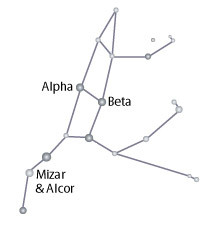 The most common pattern seen in this constellation is composed of a smaller group of the brightest stars (called an asterism) that outline the Big Dipper. This name comes from many different cultures which have seen in these stars a long handled spoon, often used for dipping water for drinking. Others call this pattern a plow, seeing instead of a dipper, an old-style, ox-pulled farm plow. The plow pattern, pulled by oxen, is the shape referenced in the myth of the Triones, the oxen and plow driven by Bootes the herder. The Egyptians and the Chinese saw different associations. Even in relatively more modern times, early European civilizations continued to invent new meanings for this pattern.